To make the sauce, heat the olive oil in a large pan then fry the onion until soft and translucent. Add the garlic and fry for another 30 seconds before adding the tomatoes. Allow the tomatoes to cook until they start to break down then add the passata, bay leaves, sugar, salt and pepper. Turn the heat down and allow to gently simmer, covered, for 30 minutes. Add a splash of water if you see the sauce cooking down too much. When the sauce is cooked, adjust the seasoning and add the fresh basil. Pre-heat the oven (with grill setting) to 220°c. 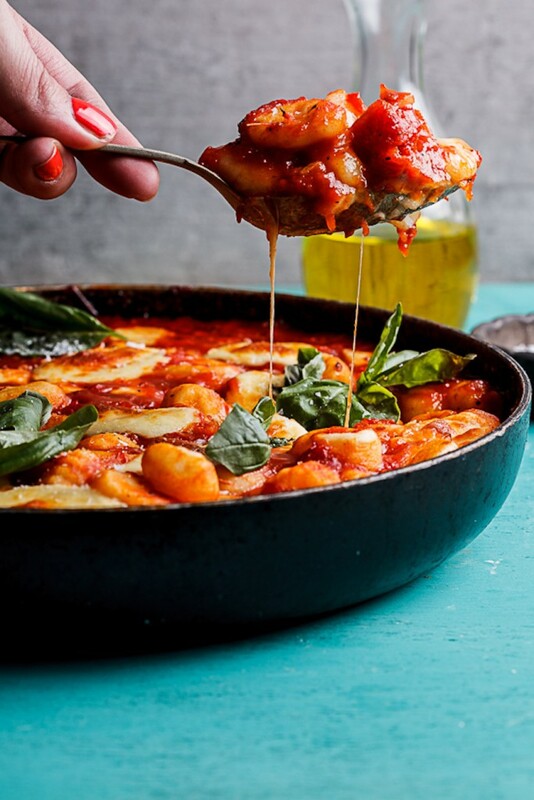 Combine the cooked gnocchi with the sauce then add cubes of mozzarella. Bake in the pre-heated oven for 10-15 minutes until the cheese has melted. Remove and top with fresh basil before serving.